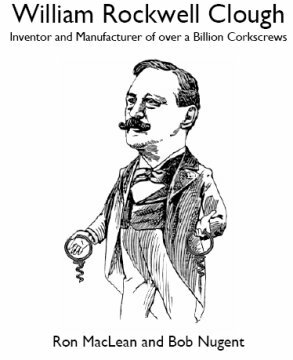 The William Rockwell Clough: Inventor and Manufacturer of over a Billion Corkscrews book was first published on the Internet in 2002 in The Virtual Corkscrew Museum. This enabled Ron MacLean to update the book on a regular basis as more information / photos were found. Now the book is without a doubt the most complete book on one of the greatest corkscrew inventors / manufacturers of all time. You will be fascinated by the life history of Clough woven with over 300 black and white photographs and drawings with detailed descriptions and corkscrew tales. You will find photos and information on all 43 patents issued / related to Clough. You will find information on Clough type corkscrews produced outside the USA. There's a list of cataloged mini advertising corkscrews. And much more. All of the chapters are arranged for enjoyable reading and research.